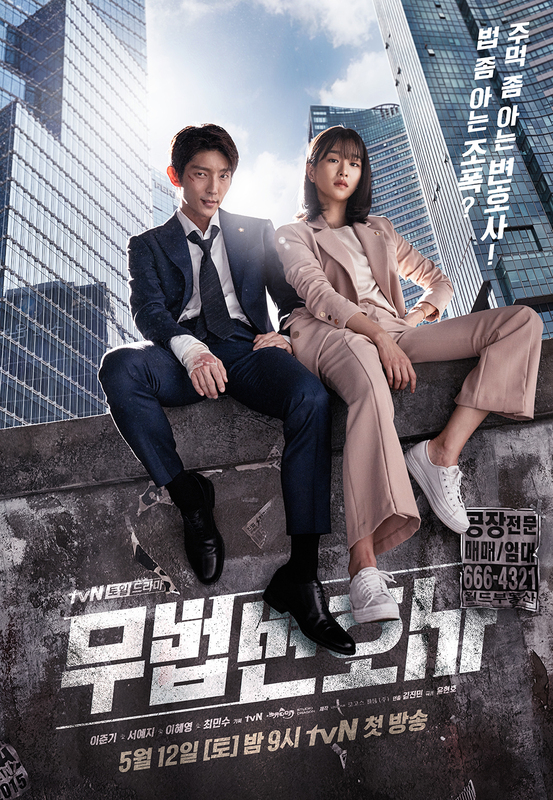 Lawless Lawyer is Lee Jun Ki’s first drama I watched after Scholar Who Walks the Night (MBC, 2015) and it did not disappoint me. It reminded me a lot of Untouchable (jTBC, 2017-2018). I happened to finish Untouchable before watching Lawless and it’s not a good idea I think. The two dramas shared fairly same premise and same characters. The antagonist, the evil person with an appearance of an angel, controlling the whole city. In Lawless the evil was the judge, Cha Moon Sook (played by Lee Hye Young) meanwhile in Untouchable the evil was the mayor, Jang Beom Ho (details please refer to my Untouchable review here). The two characters had so many similarities. Both were the city’s most beloved person. Both had the highest power in their respective city. They worked with underground people. They also had so many dirty secrets. Both lured the lead characters to them that in the end became their downfall. The protagonist, the lead character, also shared many similarities. Lawless’ Bong Sang Pil (Lee Jun Ki) and Untouchable’s Jang Jeon Seo (Jin Goo) were like crazy dogs. They only had one goal and would do anything to achieve that. Their driving force was different but they shared the same spirit of unraveling the city’s most beloved person’s dirty secrets. As stated earlier, Lawless is Lee Jun Ki’s first drama I watch after Scholar and as always his performance never disappoints. Him in Lawless, to be honest, was flawless. I felt like Seo Ye Ji was too soft for Ha Jae I role several times. She was great and all of course, but occasionally I wanted her to be more baddass but she was too soft 😦 But Seo Ye Ji was great. Choi Min Soo (Ahn Oh Ju) was hella great. Together with Lee Hye Young they both effortlessly brought their characters to life. They were extremely impressive. Their performance will be remembered for a long long time. It’s a pity that Lee Jun Ki and Seo Ye Jin were the leads but their performance wasn’t memorable -for me. Meanwhile the second leads completely took the spotlight from them. Can’t blame Choi Min Soo and Lee Hye Young though. Maybe because Ahn Oh Ju and Cha Moon Sook characters were more interesting for me. They also had more weight and more complex. These second characters were also the backbone of the drama. The actors’ presence was also stronger as a whole. It’s really a pity but I guess it just couldn’t be helped. Lawless was actually lighter than Untouchable in term of plot and goriness. There was love line too in Lawless so if you’re a romance fan you can watch this instead of Untouchable. What’s refreshing from Lawless was Bong Sang Pil was so eager to tell everyone that he’s the boy who got away ever since his arrival in Kiseong. In similar dramas, usually the character hold his/her identity a secret all the way until the end. By revealing his true self, Bong Sang Pil pressured Ahn Oh Ju and Cha Moon Seok a lot. The plot progressed quite fast. The writer managed to squeeze in highlight moment in every episode i.e the death of Bong Sang Pil’s uncle in episode 8. Ha Jae I’s mother brave move to meet Ha Jae I in episode 9. The problems were engaging and without suffocating me much unlike other dramas in same genre. One great point! The romance! The romance though. I personally think it was totally possible to omit the romance and it wouldn’t affect the plot much. It felt like the romance was just thrown in to meet the demand. Lawless was a great watch from start to finish. Not as heavy as Untouchable even though both had many similarities. Each of them was great on their own. Each had its own strong and weak points and it’s not fair to compare them because it’s not apple to apple. I truly enjoyed both. And to be honest, Lawless’ Ahn Oh Ju and Cha Moon Seok characters were perfectly written. These two will be remembered for a long time.